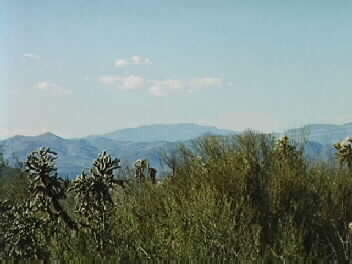 This is a photo from old Camp Grant looking toward the Pinal Mountains, seen in the distance. Old Camp Grant was the site of some of the most famous episodes in all of Arizona/Apache history. It is located about 40 miles south of Globe, near what is now the Aravaipa Campus of Central Arizona Community College (near Winkelman, AZ). The site is practically invisible to all passersby, actually split in half by a modern highway. It was in operation from about 1859 to 1872, when General George Crook moved it to "new" Camp Grant, just south of the Graham Mountains, near Safford and Willcox, Arizona. "New" Camp Grant (or Fort Grant) is now the site of a penal institution. It was near Old Camp Grant that the infamous Camp Grant Massacre of 30 April 1871 took place. 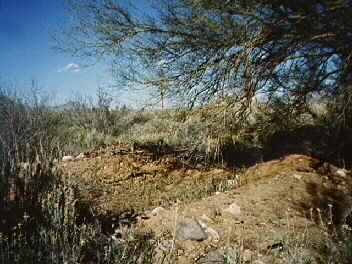 This is a photo of some of the very few remains of old Camp Grant. It is remarkable that this site has not been preserved. It is one of the most famous spots in all of Arizona history.